RTP is often an underestimated metric when it comes to casino games, as most players are interested in the visual effects, the bonuses, the number of paylines and the maximum jackpot prize that can be won. The Dead or Alive RTP is 96.80% and below we’ll tell you a bit more about what that means in particular, and what RTP is in general. Remember, the RTP figure is of utmost importance, as it tells you how fair a game is, or to be more precise, how good your chances of winning are. We have a Dead or Alive RTP of 96.80%, which is actually quite a good and favourable figure. It is in line with the general NetEnt RTP policy and we must note that NetEnt games usually feature higher RTP percentages compared to other game and since the Dead or Alive RTP is actually closer to 97% than to 96%, it can be said that this game is even more lucrative than most NetEnt slots and that says something. So, we can conclude that your winning chances at this game are definitely alive and if you’d like to know more about the game in general, have a look at our Dead or Alive review. One way to explain and discuss RTP is to discuss money instead of percentages. So, if the Dead or Alive RTP is 96.80% we can expect the house to return £96 and 80p from every £100 that have been wagered. However, this is just the theoretical RTP. The RTP percentage is calculated on an extremely high number of games, and it is impossible for one player to play that many games in one session. In the long run we can expect the house to pay out that percentage, but in an individual session, of course, your aim would be to win more than what you’ve wagered. And that is possible due to the fact that in an individual session there can be a great discrepancy between the theoretical RTP and the return rate from that session. So, once you choose that Dead or Alive is the game that you wish to play, it won’t make sense to concern yourself about the Dead or Alive RTP any longer, especially since the way you play the game has no bearing on the RTP. 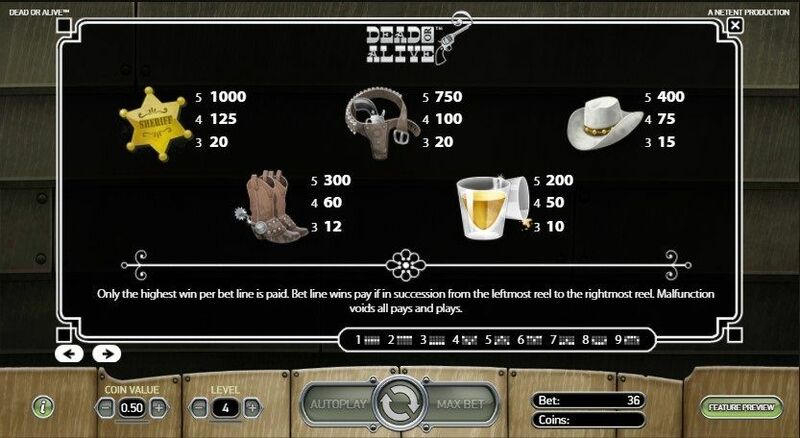 As we’ve discussed in the main review, Dead or Alive slot features nine paylines and you may have noticed that many games have a higher number of paylines – 20, 25, or even more than that. It may seem that a game with a higher number of paylines gives you more chances of winning, but that’s not necessarily the case. The RTP is the only figure that shows us how lucrative a game is and the only figure that allows us to objectively compare two games and decide which one is more favourable. In the case of Dead or Alive slots, it is better than most.